Bruin Thompson and Chris Waltho. 'Sandy’ Robertson, Roger Hyde, Chris Buckley, 'Fred’ Thomas, Simon Leman, Mike Stannier, Russell Marsh, Mark Banks and John Hudson. "I'm afraid you can't go," said the avuncular figure on the bean bag. "It's the deer stalking you see." It was May, but even so the rain lashed against the glass walls of Bradford University building where the board of the S.H.S was in crisis session. The man on the bean bag stared intently out of the window as if expecting to find the answer in the storm clouds rolling down from the Yorkshire moors. Then turning back to the room he said; "So Rhum is out this year, but Moidart, on the mainland has been suggested." There was a stirring in the room, and the short-lived confusion that goes with ten people opening maps at the same time. I found Moidart and stuck my finger on a deep glen running south west into Loch Shiel. And that is where we went. I'm glad that we did, for the site at Glenaladale is one of the most beautiful I have visited. The first glimpse of Loch Shiel from the viaduct at its head cannot be improved on as an introduction to an area where the hills rise steeply from the calm loch, their sides dappled by forest and sunlight. The deep initial impression was reinforced by the boat trip that took us from the comparative civilisation of Glenfinnan to the tranquillity of a glen deserted by its inhabitants nearly a hundred years before. The sun shone for us, and the camp was rapidly established. Intrepid souls immediately crawled over the glen where Bonnie Prince Charlie spent the night before sailing to Glenfinnan, and raising the standard of rebellion on another warm August day in 1745. 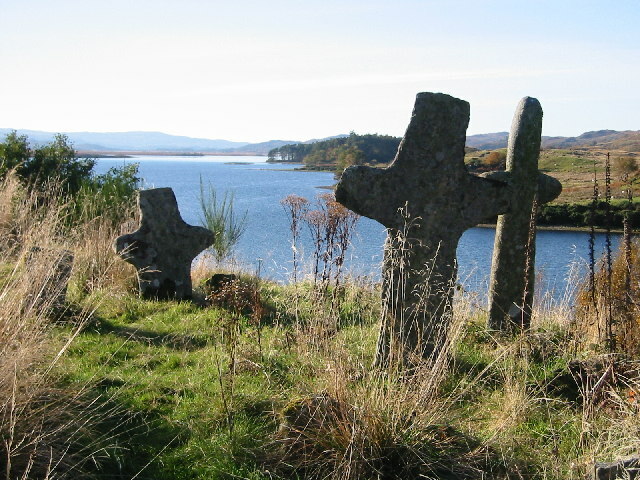 Our canoes sailed down the isles to the sacred isles of St. Finnan, and the party lunched amongst the graves of generations of Highlanders. The climbers found a convenient rock and set about it, and the first bivvy party set out on one of the rare rainy days to visit the Forestry Commission settlement at Polloch. Some fiend dreamed up a peak contest that set the fit at every slope to hand, and the cunning at every ridge that was possessed of several peaks in a row. malevolent beasts rose up from the heather. Nevertheless the sun continued to shine, the bivvy parties kept going out, and an enjoyable rhythm developed to our daily appreciation of this calm place. 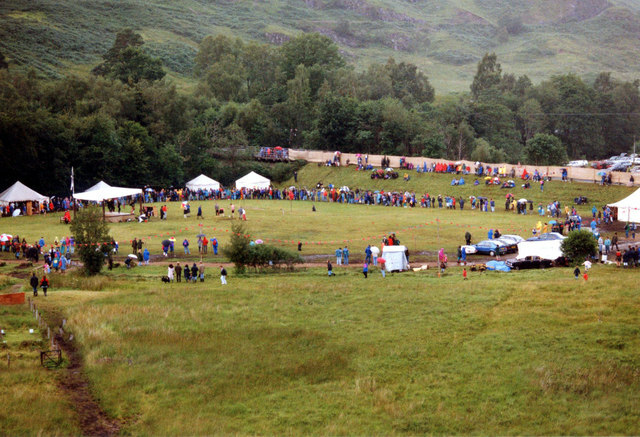 The Highland gathering at Glenfinnan momentarily interrupted this rhythm, for this was a special, and essentially local and annual event. It is true that some of the pipers were from Australia, but the crowds in the main were not tourists but local people from the surrounding countryside. Friends who had not met for a year exchanged yarns and drams while youths competed at piping, dancing an Irish jig, hill-racing, and throwing things. I threw balls at Coconuts, but desisted when I hit the thumb of the girl taking the money. Never mind - the trip back up to camp on Henderson's boat, with Henderson's festive friends, made up for it, even if I was pinned to the gunwhale by an unsteady man with an unsteady gaze with copious and mumbles stories of the way. We had our own games on the last day, although 'Throwin' the welly’ didn't have the same ethnic appeal as a telegraph pole. When at last we left Glenaladale it was in the full knowledge that we had pioneered a site that was worth returning to. And when we departed it was with gratitude to John Hutchison who did so much to set the thing up, to Robert Crockett, the stalker, and his wife for bringing bread post and advice, and to the admin men of the Society whose arrangements went so smoothly.